Your results can be exported in various output formats. Simply hover over the 'Output' heading at the top to reveal 3 options to export your results. The printable version option formats the results such that it can readily be printed directly from your browser. This is a quick and easy way to print your results without having to firstly save an image or PDF beforehand. The image below shows the print ready format. To return back to the original results, simply click the link at the top which asks to restore the original solution page. The save to image option creates a downloadable image of all of your results. Selecting this option will open up a pop up with a download link as shown below. 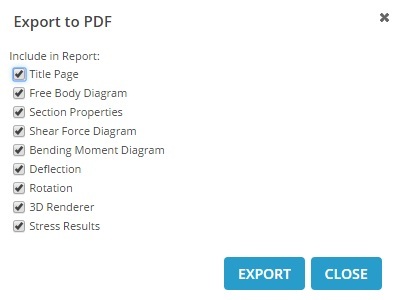 The save to PDF report option creates a downloadable PDF of your results. Selecting this option will open up a pop up with options to pick out all or some of the results to be reported on. Click 'Export' to generate the PDF.